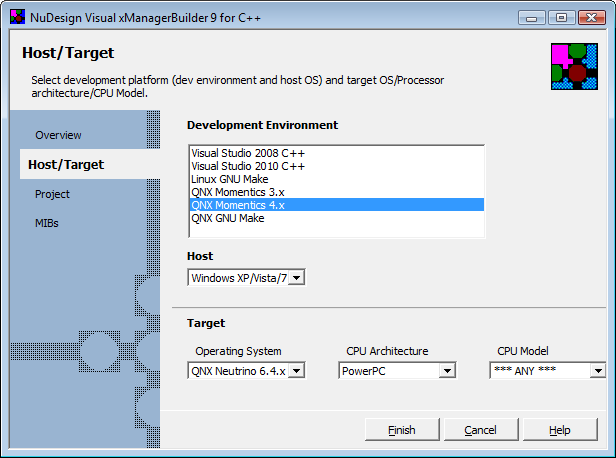 SNMP xManager Builder, C++ code generation wizard for MS Windows. It generates SNMP Manager Application Projects for MS Visual Studio. SNMPv1/v2c/v3 C++ Management SDK Libraries for multithreaded SNMP Manager Application for Windows. Supports Send / Receive Traps and Informs functions. Sample code in C++ demonstrating typical management functions, such as Get Table, MIB Browser, SNMP Polling Engine, Trap handling and others. Supported host environments are Windows Server 2003, Server 2008, Server 2008R2, Server 2012, Server 2012R2, Server 2016, Vista, Windows 7, Windows 8/8.1 and Windows 10, 32bit or 64bit versions. SNMP xManager Builder comes in the form of a standalone wizard that produces complete SNMP Application C++ sources and project files for Microsoft’s Visual Studio (VS2008 or higher). Initially, when xManager Builder is run, the developer can load mibs in the wizard. By loading the mibs at design time, information about the mib objects is available programmatically to the developer. Most commonly used mib object information such as OID and object name, access and status are available to the developer. However, through the use of XMC files, pre-compiled mib information can be read by the NuDesign SNMP management libraries to provide the mib information at run time as well. The information can be used to build the complete tree object information depicting the MIBs implemented in the SNMP Agent that the SNMP Manager is connecting to. The SNMP Manager can make Get and Set request using the object names, it can receive the SNMP Traps and decode them using the pre-compiled MIB object information as well. The XMC files are either created by the xManager Builder (in the xmc directory of the project) or by the NuDesign MIB Compiler control. The XMC files can be considered to be a concise version of the mib file. Each object in the mib file is represented by a single row in the XMC file. The resulting SNMP Management Application runs under the MS Windows. However NuDesign supports build of SNMP Management Application using the SNMPv1/v2c/v3 C++ Management SDK Libraries, generated C++ source code and project files under Linux and embedded environments such as QNX as well. Please contact us for more information.